In 2009 Reliance’s Dutch office received a call from Mr Thijs Meenink at the University of Eindhoven. In a collaboration with AMC Amsterdam, his team was working on a robotic device which could assist in eye surgery. John Bazuin, catalogue products manager at Reliance visited the university to see if Reliance could be of assistance. He left a range of sample products and kept in close contact with the design team as their developments progressed, eventually resulting in the integration of Reliance’s high precision hubless spur gears and leadscrews. Now, seven years later, the device has performed the world’s first successful robot assisted operation at Oxford’s John Radcliffe Hospital and is the core product of the newly founded company Preceyes B.V. The device, now called the PRECEYES Surgical System, supports vitreoretinal surgeons in high precision procedures. It manipulates the instrument that enters the eye and is controlled via a motion controller that is held by the surgeon. The instrument manipulator, which is the robotic part that controls the instrument, has seven drives, including the leadscrews – the product which began the connection between Reliance and Preceyes – and the high precision gears manufactured by Reliance. Together they enable an extremely precise translation of the movements directed by the surgeon via the motion controller to the actual movement of the instrument inside the eye. 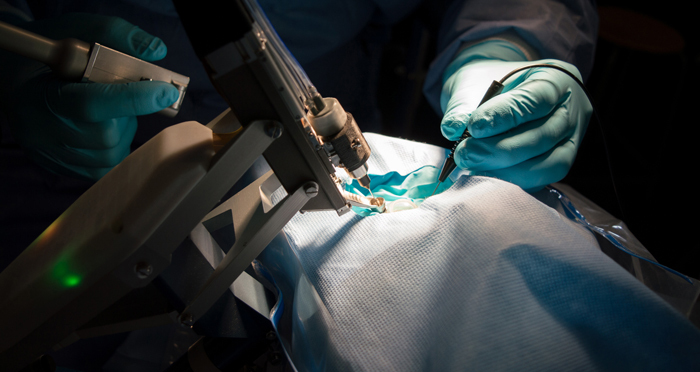 Robot assisted operations are now relatively common, but they have never been used for eye surgery. The operation performed with the PRECEYES Surgical System is a fairly common operation, performed 0.5 million times a year, involving the initiation of a membrane peel. The PRECEYES Surgical System assisted in lifting the membrane. As the membrane is only micrometre thick it requires the highest level of skill and experience from the surgeon. This robotic system is a lot more precise and stable than the human hand. This innovation not only means improvement in eye surgery, but it is anticipated that it will actually enable eye surgical procedures which are currently impossible due to the limitations of the human hand. One of these procedures which Preceyes is now investigating is high precision drug delivery. Reliance continues to support Preceyes with these new developments and is proud to be part of the PRECEYES Surgical System, a device which will give many patients the possibility of better eye sight in the future.